I recently bought myself a birthday present: an Analog Discovery 2 USB oscilloscope. The device normally costs $279, but I qualify for the academic discount, which brought the price down to $179—a very good deal. This oscilloscope is better in every way than the Bitscope BS10 that I bought about 4 years ago: functions, resolution, bandwidth, software, … . The Analog Discovery 2 is also cheaper (at least with the academic discount). I’ve been playing with it a little bit, and I decided to try to reproduce a few of the plots that I have done before. 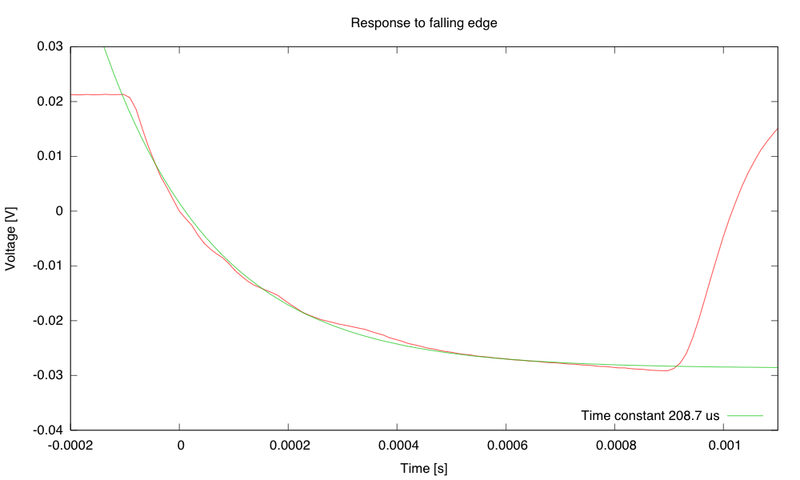 This post is about creating the plot of the Miller plateau for an nFET (see, for example, More on nFET Miller plateau). 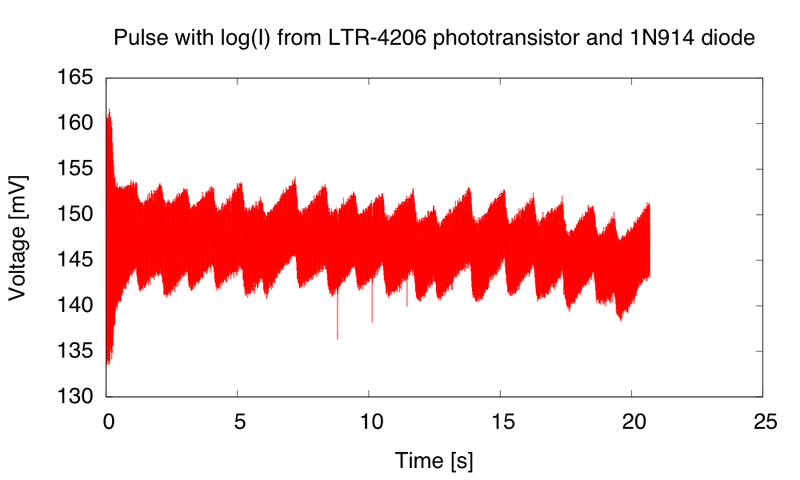 With the Bitscope, I had to filter the 5V power (which was just passed through the device, record many traces, process them with a program I wrote myself to remove the jitter in the triggering, average them, and plot with gnuplot). 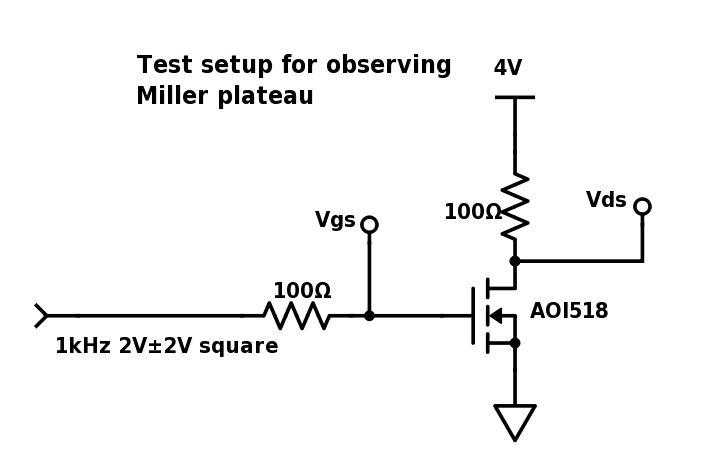 The 100Ω gate resistor is to limit the current from the 1kHz square wave generator, so that the Miller plateau is stretched out in time. With a 100Ω gate resistance, the plateau is about 146ns long (easily measured with a pair of cursors not shown in this image). The average voltage is about 2.87V, so the current is (4V-2.87V)/100Ω=11.3mA, and the gate drain charge is 1.65nC, about half the 3.2nC on the data sheet (which was measured with different circuit parameters and is supposed to be a worst-case). Note that this is a single trace, but multiple traces show almost no jitter, even though we are sampling at the full 100 Msample/second rate. 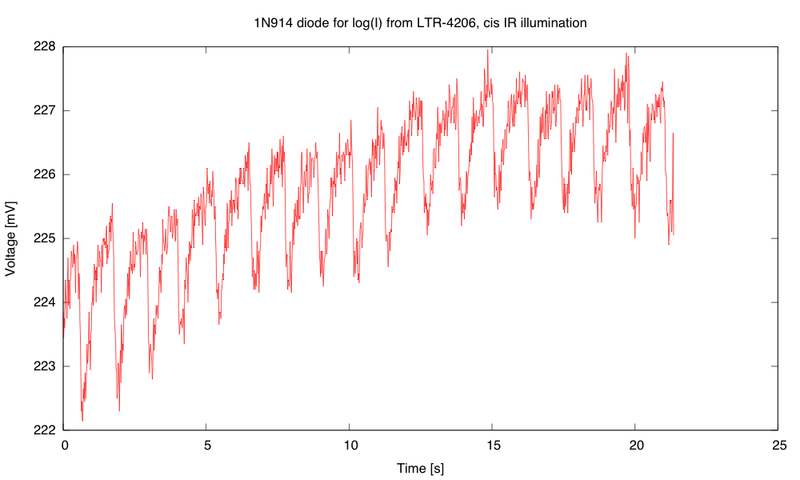 Averaging the traces would not make much difference in the signal. With no gate resistor, the Miller plateau is only about 40.2ns long and averages 2.987V. If we assume 1.65nC in 40.2ns, we get a 41mA current, and (4V-2.987V)/41mA=24.7Ω for the output impedance of the function generator. I may not have placed the cursors in exactly the same places on both curves, so this is a terrible way to estimate the output impedance of the function generator. The falling edge takes about 50ns. 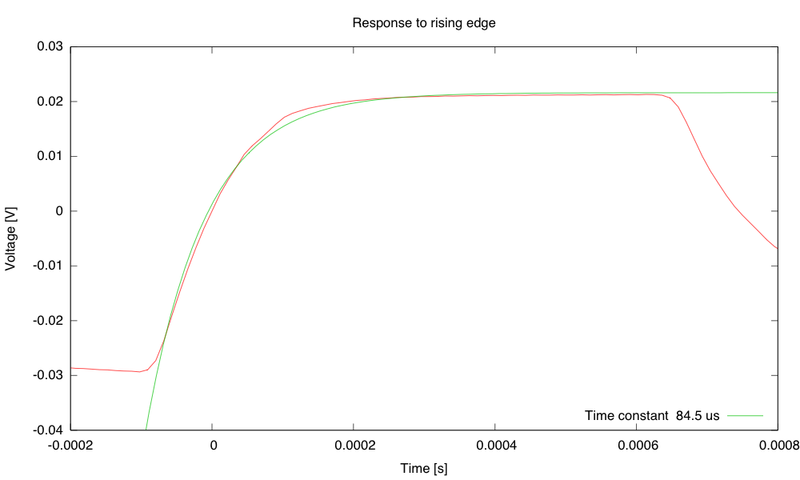 The rising edge takes about 50ns. The edges are limited by the wiring, and I may be able to get better edges by using the BNC adapter board and 50Ω coax cable, rather than the wires provided, but I don’t happen to have any BNC coax cable handy. 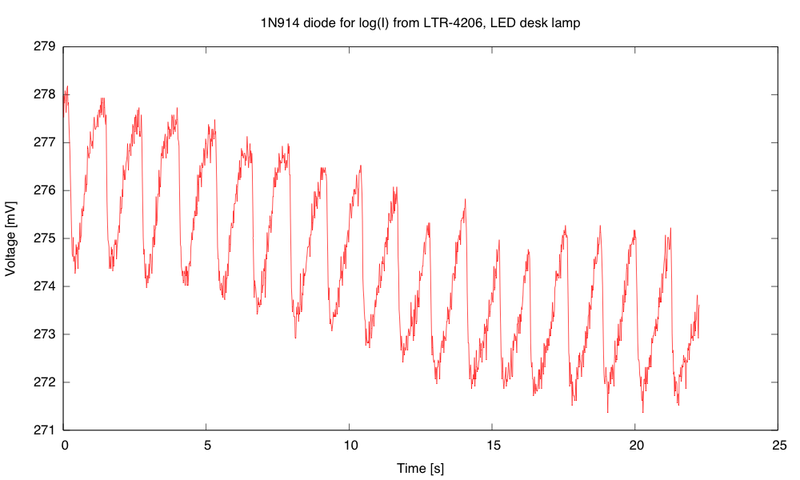 In Dehumidifier, I provided spectral analysis of the sound from the 30-pint Whynter RPD-321EW Energy Star Portable Dehumidifier, using my BitScope USB oscilloscope to record the sound and averaging the absolute value of the FFT over 100 short traces. Today I decided to improve the FFT analysis by using the scipy.signal.welch() function to split a longer trace into windows, apply a Dolph-Chebyshev window-shaping function, and average the resulting power spectra. 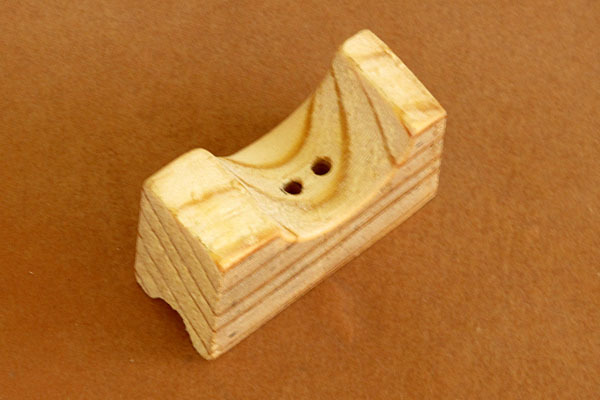 The main improvement here is the use of the window-shaping function. 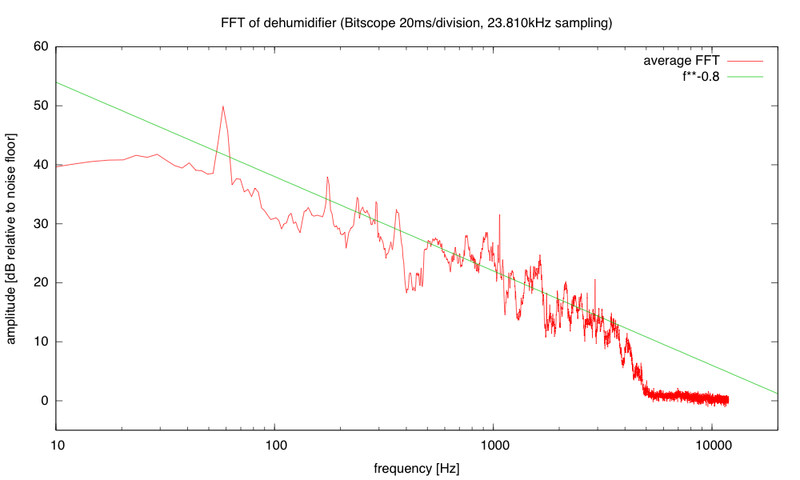 The dehumidifier looks very much like 1/f noise, with a big spike around 1050Hz. The spikes at 60Hz, 120Hz, 240Hz, and 360Hz may be electrical noise picked up by the sound amplifier, rather than acoustic noise. Using Welch’s method and a proper window function results in a much cleaner spectrum than before. I used a 216 FFT window for the analysis, since I had plenty of data, which gives a fairly fine resolution of about 0.23Hz. The 60Hz spike is appearing at 58.36Hz, which is a little troubling, as the PteroDAQ crystal and the power company both have better frequency control than a 2.7% error. The 120Hz, 240Hz, and 360Hz spikes are at most one bin off from where they should be, so I don’t understand the shift at 60Hz. I checked my code by testing with a recording of a triangle wave, and found that Welch’s method with an 80dB Dolph-Chebyshev window did an excellent job of removing the spectral smear that I was getting by just averaging rectangular FFT windows (my first approach). 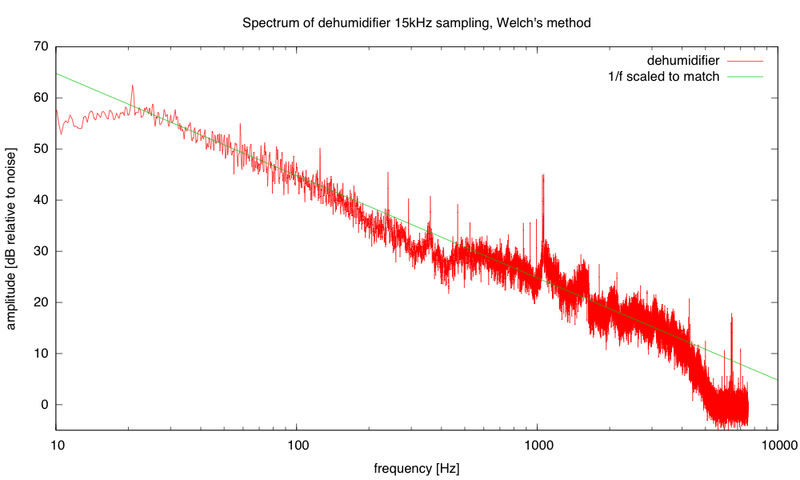 The noise floor for Welch’s method on those measurements was pretty much flat across the entire spectrum (maybe rising at higher frequencies), so the 1/f plot here is not an artifact of the analysis, but a real measurement of the acoustic noise. 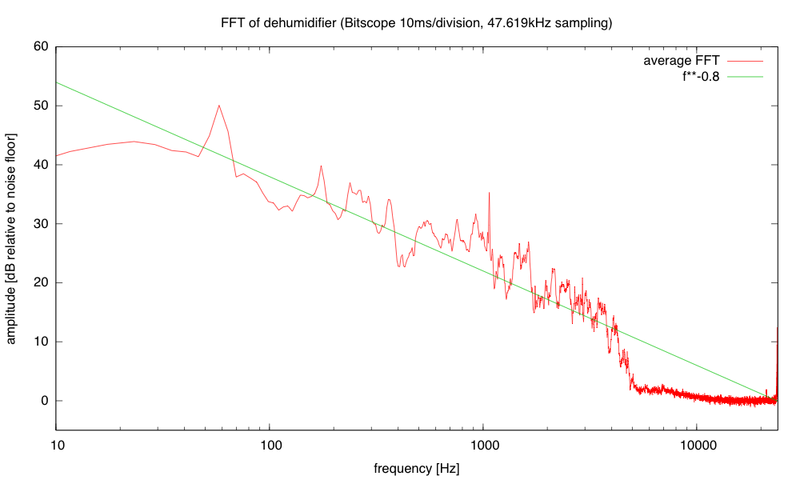 Using 60dB window resulted in a higher noise floor, but 100dB and larger did not lower the noise floor, so I stuck with 80dB as a good parameter value. It might be useful to use other values if the FFT window width is changed or the noise in the data is different. I’ve included the source code for the program, so that others can use it. It does require that SciPy be installed, in order to use the scipy.signal package. whose subsequent columns are floating-point data values. May contain multiple traces, separated by blank lines. """Generator that yields traces from tab-separated rows of data. columns, one of which is selected to be the values for the trace. New traces are started whenever the timestamp in the first column decreases. trace is deduced from the timestamps. echo_comments_to, if it is not None. If none specified, then estimate sampling frequency from the timestamps. help="""Max window size (in samples) for FFT. help="""Use Welch's method to produce averaged spectrum from windows. 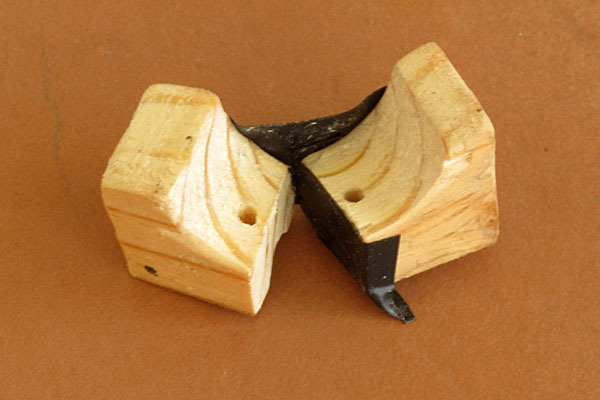 Value is dB difference between main lobe and sidelobes for Dolph-Chebyshev window. 80 seems reasonable with 16-bit data (60 produces a higher noise floor, without noticeably narrowing the spikes). # input file may contain separate time traces. # Each new trace stats when the time value is less than the previous time. # overlapping windows are allowed. I will be buying a dehumidifier for our house, to reduce the condensation on the walls. Current Energy Start rated dehumidifiers remove about 1.85 liters of water per kWh used, and I don’t think we need to remove 2775 liters of water a year (7.6 l/day) from our house, so the dehumidifier will add nothing to our electricity bill. Based on reviews (in Consumer Reports and on Amazon), we’re looking at the 30-pint Whynter RPD-321EW Energy Star Portable Dehumidifier, as it has good performance in cool rooms (our house gets quite cool in winter, especially when we’re both at work) and is relatively easy to empty (we don’t have a convenient way to rig up a drain hose). We bought the dehumidifier and it seems to work ok. The timer is a bit crude, as it does not have a time-of-day clock, but you can set up a delay of up to 24 hours for turning on and turning off. This means that we’ll have to reset the timer daily. That’s not as much of an imposition as one might think, because we have to empty the water daily any way. People running a dehumidifier with a drain hookup might find the need to reset the timer more of a nuisance. Our biggest disappointment with the dehumidifier is that it is loud. They claim that it is only 53dB, but it seems louder than that to me—unfortunately, I don’t have a sound pressure meter to measure it with. The compressor is fairly quiet, but the fan is loud, which suggests a poorly designed air flow. We can run the dehumidifier in the living room, but not in the bedroom, because of the noise it makes. The noise is “pink” noise, with more low-frequency components than high frequency ones. The 5kHz cutoff is not an artifact of my amplifier, which has fairly flat gain out to about 100kHz, nor of the microphone, which is fairly flat to at least 20 kHz. The 60Hz peak is sharper here, and 120Hz is clearly missing, but the next several harmonics of 60Hz are present. I don’t have an explanation for the dip between 400Hz and 480Hz. I don’t know whether the spike around 1067Hz (in both plots) is an artifact of my test setup or is present in the sound. I suspect it is present in the sound. We plan to run the dehumidifier only during off-peak hours (at night or weekend days), for about 45 hours a week, which will consume about 800kWh a year. At PG&E off-peak rates, that is around $120 a year, but we had $98 of unused Net-Electric Metering (NEM) credits, and our minimum bill is around $111, so the extra electricity use will make no change in our bill. We will probably want to pay for carbon offsets, though, since we are increasing our carbon footprint by about 0.23MT (so about $2 in carbon offsets).